When I was a little girl, I grew up loving cats — they were so athletic, graceful; they could walk around without a sound. They were enchanting — but so are CH cats for exactly opposite reasons. One of my favorite things (of many, which you can read here) about our CH kitties is that you can hear them walk where ever they go. It’s not as noticeable on the carpet, but on the hardwood you can’t miss it. They have heavy, deliberate footsteps, and I think it’s charming. It’s purely a selfish reason why I like it — hearing their footfalls tells me exactly where they are. Apparently I’m not the only one who knows. A few weeks ago our downstairs neighbors were outside when they ran up to our porch. Their kitten, who they let roam around the front yard, had climbed the stairs to our front door. Our neighbor peered into our open, screened window, said hello and made a faint gasp — she saw Ellie. Thankfully the neighbor said it in a nonchalant way; I didn’t get the impression that she or her roommate were upset by it. However, it did make me rather conscious of the noises our cats make! 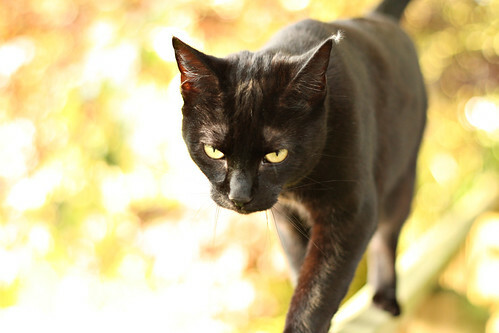 Can you hear your CH cat walk around your home? Do you notice it if you’re a floor below them? Please share in the comments! My house has wood floors, and just last week, I was down in the basement with a friend, working on the furnace, when I heard Dotty marching around upstairs. I love hearing her walk around. But no one can use the phrase “on cat’s feet” with her. Good reference! But I agree, “Fog” doesn’t really apply to our CH kitties 🙂 If only Carl Sandburg had a CH cat of his own! i don’t have a ch cat but he is a heavy walker. i have 5 cats and he is the only one that walks heavy. any thoughts?